OUCET 2016 Notification, Osmania University Common Entrance Test 2016 Important Dates, Online Application. 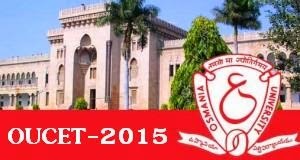 Osmania University is going to release the OUCET Notification 2016 in April 1st week. We are here providing the Notification, Online Application along with Eligibility Criteria. Osmania University is conducting OUCET 2016 for admissions into PG, PG Diplomas, and 5yrs Integrated courses offered by OU , Telangana University, Mahatma Gandhi University, and Palamuru University for a total of 52 courses (39 PG courses, 10 PG Diploma courses and 3 & 5yrs. Integrated programmes). Number of seats available is around 18,625 out of which 4,867 seats are in the university colleges and remaining 13,758 seats are in affiliated colleges. The Osmania University Common Entrance Test is conducted by Osmania University for admissions into OUCET 2016 - Osmania University Common Entrance Test - Admission & Entrance Exams various PG, PG diploma and Five year Integrated Programmes offered by Osmania, Telangana, Mahatma Gandhi and Palamuru Universities. This time, the application submission is online mode only through the websites www.ouadmissions.com or www.osmania.ac.in. The decision to introduce online submission is taken by OU to facilitate the candidates to submit the application from any where. To prevent malpractices, test booklets with A and B series are introduced. To avoid impersonation left hand thumb impression of the candidate will be taken on Nominal rolls / Photo identity sheets. The candidate has to use the Black / Ball Point Pen only to darken the ovals in OMR sheet and no NB pencils are allowed. To be eligible for admission to a course, the following must be fulfiled. The candidate must have passed/appeared for the Qualifying Examination and secured the prescribed Minimum Marks in the Subject(s) / course(s) concerned as mentioned in the Information Brochure and The candidate must have qualified in OU Common Entrance Test conducted by the University in the concerned subject in which admission is sought. For administrative reasons, the University may, conduct the entrance test before the publication of the results of the qualifying examination. This exam ensure your entry into above mentioned courses under such universities as OU, Telangana University (TU), Mahatma Gandhi University (MGU) and Palamuru University. The authorities has decided to arrange two series of test booklets at the time of exam only to ensure a healthy exam. They are also taking the left thumb impression to avoid impersonation at the time of exam. OUCET 2016 Application Form and OUCET Notification 2016 is now available. There will be no exam for such courses which received less application. It is informed by the authority that the admission of political science, public administration, and social science courses will be without examination. 18,625 no. of seats are available out of which 4,867 are in the university colleges and remaining seats are for affiliated colleges. The last date is 09/05/2016 but with a late fine of Rs.250/ one can apply before 16/05/2016. OUCET 2016 Notification and OUCET Application Form can be downloaded online at any of given Osmania University Websites : www.ouadmissions.com and www.osmania.ac.in . Important Dates: Submission of applications commences from 15.04.2016. The Last date for submission of applications is 13.05.2016. The same with a late fee of Rs. 300/- is 22.05.2016.